Do you want to track links and button clicks in WordPress? You can use Google Analytics, but you’ll need to add lots of event tracking code manually as events (like links and button clicks) aren’t tracked by Google Analytics automatically. Or, you can use the smart Google Analytics WordPress plugin MonsterInsights to automate links and button clicks tracking. In this article, we’ll show you how to track links and button clicks in WordPress step-by-step. Why Track Links and Button Clicks in WordPress? Links and buttons are major points of user interaction on your site. Most often, you’ll use links and buttons as the call to action elements that you want your users to click. Affiliate links will lead your users to buy your referred products and let you earn some referral income. Add to Cart buttons will lead your customers to buy a product from your store. Form Submit buttons will help your users to send a message using your online contact form. File download buttons will help your users to download files from your site. Outbound links will redirect your readers to other websites (resources) you want them to go. As you place these links and buttons for users to interact with on your site, tracking them can help you understand how exactly your users are interacting with them. 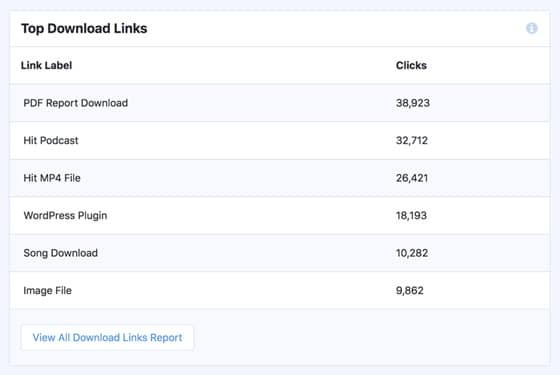 By tracking your links and button clicks, you can find out which type of links are getting more clicks, which buttons are more popular, and much more. Then, you can analyze the reports and make improvements. After you’ve optimized your links and buttons, they’re sure to get more visibility and more clicks. The more clicks, the more the interaction and engagement. When users are more engaged on your site, your site conversions will increase significantly. In the nutshell, tracking events like links and button clicks can help you to understand exactly how your users interact on your site so that you can make informed strategies for your business growth. Google Analytics can provide you with your entire website’s metrics but it tracks only pageviews by default. If you want to track events such as links and button clicks, or transactions like eCommerce purchases, you’ll need to manually set up tracking for each event or transaction. Unfortunately, setting up event tracking in Google Analytics is somewhat tricky, so newbies can get lost quickly. If you lack experience, you’ll need to hire an expert to help you to set up your Google Analytics tracking. That’s why we recommend you use MonsterInsights to track your Google Analytics metrics with ease. MonsterInsights makes the entire process of using Google Analytics in WordPress super simple so anyone can easily set up Google Analytics and configure advanced trackings such as events and transactions. 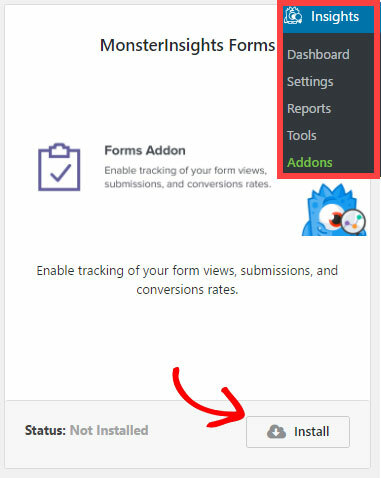 To get started, you’ll need to download MonsterInsights, install it on WordPress, and then connect your site with your Google Analytics account. You can set up Google Analytics in WordPress with just a few clicks using MonsterInsights. For detailed instructions, here’s our guide on how to properly set up Google Analytics in WordPress. Once it’s set up, you can view the overview report for your site on your WordPress dashboard from the MonsterInsights Dashboard Widget. To view detailed reports for your site, you’ll need to go to Insights » Reports from your WordPress dashboard. Now, let’s go ahead and check how to track links and button clicks in WordPress using MonsterInsights. 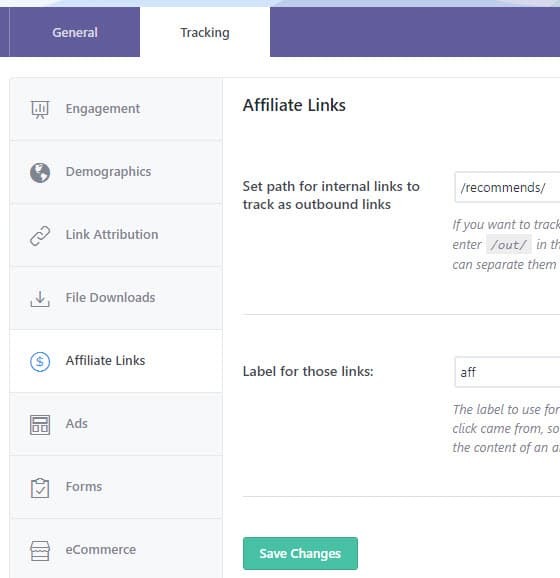 MonsterInsights makes affiliate links tracking really simple. It’ll take just a few clicks to complete the setup process. Navigate to Insights » Settings from your WordPress dashboard and then click on the Tracking tab at the top of the page. Then, go to the Affiliate Links tab in the left taskbar. In the above example, your affiliate link begins with /recommends/. You can simply copy the prefix /recommends/ on this field, so Google Analytics can identify which internal links are affiliate links. If you use multiple prefixes, you can separate them with a comma: /recommends/,/out/. The label in your Google Analytics report lets you identify where the click came from. For example, you can add a label aff to your affiliate links. After you complete these 2 fields, click Save Changes. That’s it. You’re done with affiliate links tracking setup. Now, you can view the reports by visiting Insights » Reports » Publishers from your WordPress dashboard. You can always click the View All Affiliate Links Report to view more reports in Google Analytics. If you want detailed instructions, here’s our complete guide on setting up affiliate links tracking. MonsterInsights eCommerce tracking helps you to track all the data you need for your WooCommerce or Easy Digital Downloads store. The eCommerce report will show total Add to Cart button clicks, total Remove from the Cart button clicks, and total Buy button clicks for your online store. To get started, you’ll need to enable eCommerce tracking in Google Analytics first. 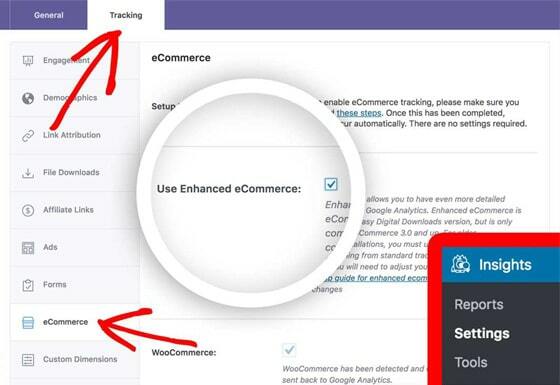 If you don’t know how to do that, here’s our step-by-step guide to enable eCommerce tracking. After that, you’ll need to install MonsterInsights eCommerce Addon on your WordPress site. Then, navigate to Insights » Settings and click on the Tracking tab on the top. Then, in the left taskbar, navigate to the eCommerce tab and select the checkbox near Use Enhanced eCommerce. That’s it! 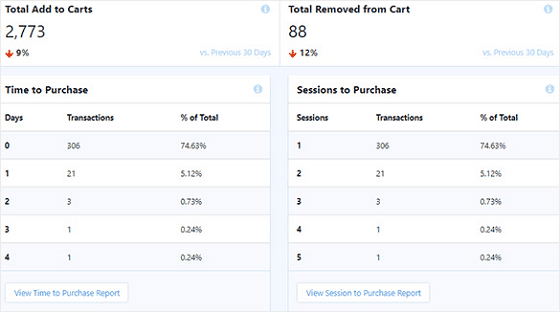 Now, you can view your eCommerce reports by going to Insights » Reports » eCommerce. As you scroll down, you’ll see how many times the Add to Cart button was clicked and also the Remove from the Cart button. 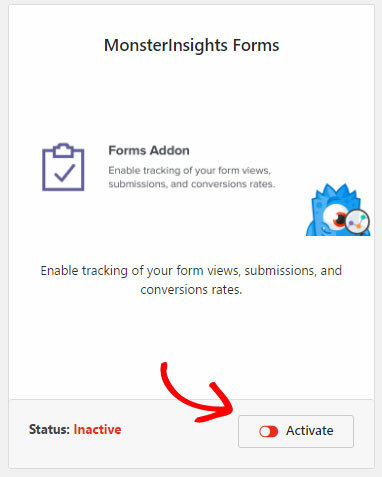 MonsterInsights comes with a powerful Forms Tracking addon to automate forms conversion tracking. By enabling forms tracking, you can view which forms are triggering the most views and submissions. The number of total submissions for forms are counted when a user clicks the Submit or Send for a form. To enable forms tracking, you’ll need to install and activate the Forms addon in your site. Navigate to Insights » Addons and find the Forms Addon. Then, click the Install button. You’ll see the button changed into the Activate option. Simply click the button to activate the addon. That’s it. You’ve completed the setup process. 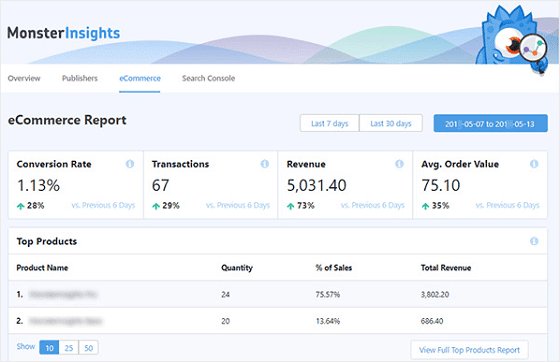 Now you can view your form conversion reports by going to Insights » Reports » Forms from your WordPress dashboard. As you can see above in the screenshot, it’ll show you how many impressions and conversions each of your forms triggered. The number of conversions refer to the total clicks on Submit or Send button in your forms. If you’ve added downloadable resources on your WordPress site, tracking the downloads can help you discover your most popular resources and help to make better resources. 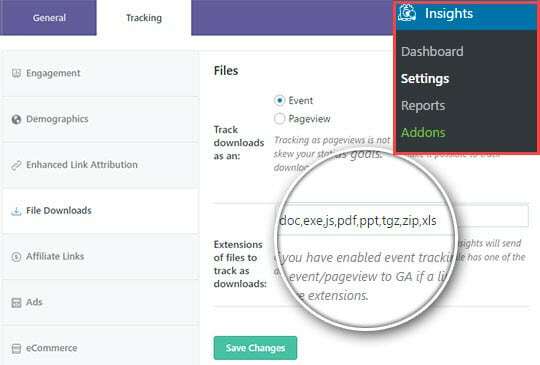 MonsterInsights makes file downloads tracking very easy for WordPress users. You can set up this feature in just a few clicks. First, you’ll need to go to Insights » Settings » Tracking. Next, click on File Downloads tab in the left menu. You can select Event to track your site downloads. Then, in the field below, you can see the file extensions that MonsterInsights tracks by default. To track downloads of more file extensions, you just need to add them to the field, separated by a comma. That’s it! The plugin will now track all the clicks users will perform to download your resources. Now, you can see your download reports by going to Insights » Reports » Publishers. As you can see in the screenshot above, you can view the total clicks each of your downloadable resources has triggered. 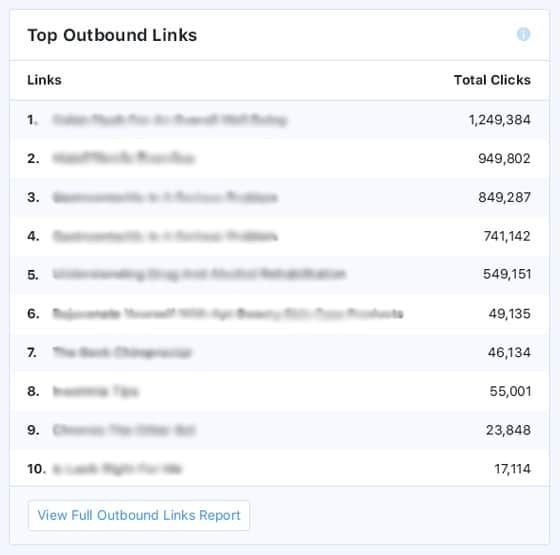 MonsterInsights tracks your outbound links clicks automatically and shows you the reports in Publishers. But you’ll need to purchase at least the Plus plan to view the Publishers report. 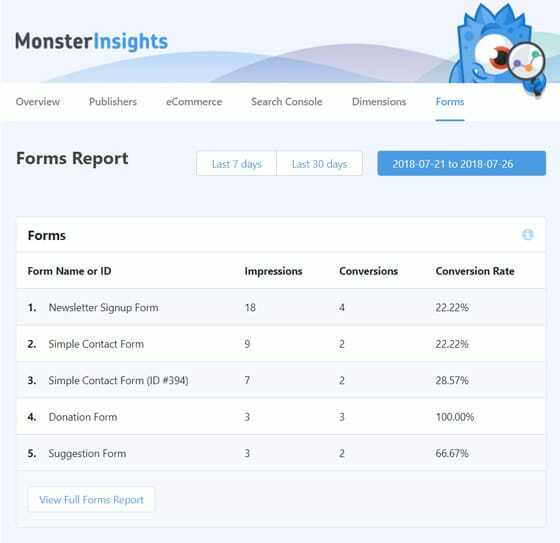 Once you’ve set up MonsterInsights properly, you can go to Insights » Reports » Publishers from your WordPress dashboard to view your outbound links reports. 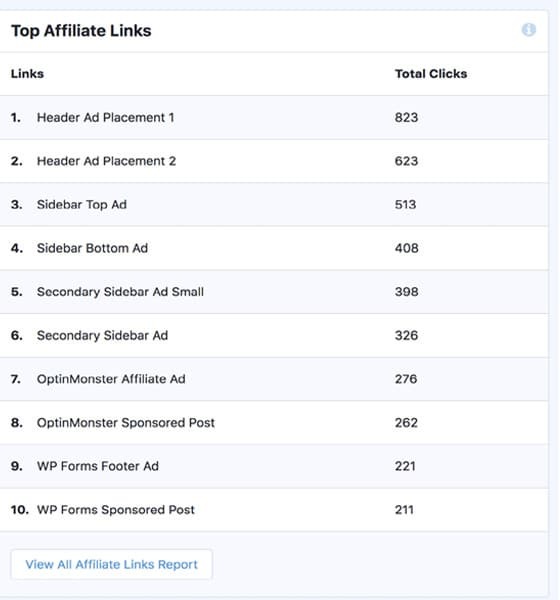 As you can see in the screenshot above, you can view your top outbound links with total clicks in MonsterInsights’ Publishers report. We hope this article helped you to learn how to track links and button clicks in WordPress using Google Analytics.